Stefan Savage, a renowned cybersecurity expert and professor of computer science at the University of California San Diego, has been awarded a fellowship by the MacArthur Foundation. Perhaps better known as the MacArthur "genius" award, the prestigious, no-strings- attached, five-year fellowship awards a total of $625,000 to each recipient [see video profile]. The award recognizes individuals whose work has demonstrated exceptional creativity; promise for important future advances based on a track record of significant accomplishments; and potential for the fellowship to facilitate subsequent creative work. Savage is being recognized for "identifying and addressing the technological, economic and social vulnerabilities underlying internet security challenges and cybercrime." "This award recognizes the creative and innovative research Stefan has been conducting since he joined the faculty here at UC San Diego 17 years ago," said Chancellor Pradeep K. Khosla. "His work has had a tremendous impact on disrupting cybercriminal networks and on raising awareness about how vulnerable cars can be to cybersecurity threats. Stefan exemplifies UC San Diego's culture of innovation that is positively impacting our global society." Savage has been on the faculty of the UC San Diego Jacobs School of Engineering since 2000. He is a professor in the Department of Computer Science and Engineering and has held the Irwin Mark and Joan Klein Jacobs Chair in Information and Computer Science since 2016. He found out that he received the award in a somewhat unusual way. The MacArthur Foundation had been trying to reach him by phone repeatedly. But Savage had not picked up because he didn't recognize the number the calls were coming from. Ever the security expert, he eventually looked up the number and found that it was associated with the foundation. He called back. He then had to prove who he was before foundation representatives gave him the good news. "I was in total shock," he said in a phone interview. At this point, he hasn't formulated a plan to spend the funds, he added. "It's wonderful to see Stefan Savage being recognized for his boundary breaking research. Stefan is an outstanding scholar, teacher and mentor. In addition, he embraces the hard work necessary to ensure that his teams' security research makes real and lasting impacts on society," said Albert P. Pisano, dean of the Jacobs School of Engineering. The award recognizes three major research directions that have driven Savage's work in the past two decades: understanding how cars are vulnerable to hacking; investigating the world of cybercrime and its economics; and creating new strategies to defend against malware. Read the full news release on the CSE website. Microbiome researcher Rob Knight, a professor with dual appointments in the Pediatrics as well as Computer Science and Engineering departments at UC San Diego, accepted the 2017 Massry Prize in a ceremony at the University of Southern California in early October. The award honors those who have contributed to advancement in the fields of health and the biomedical sciences. He split the $200,000 honorarium with longtime colleagues and co-recipients of the prize, Jeffrey Gordon, MD, of the Washington University School of Medicine in St. Louis, and Norman Pace from the University of Colorado Boulder (where Knight worked before joining the UC San Diego faculty in 2015). In accepting the prize, Knight spoke about microbial gene sequencing on a large scale. This was a necessary step in the study of microbiomes because, as Knight stated, "There are 100 million times as many bacteria on Earth as stars in the universe." "Microbiology," he said, "is the ultimate big data science." Knight's research at UC San Diego explores the intersection of biology and computer science. According to a report in The Triton, "not only is Knight pioneering the field of microbiomes, but he is also researching ways to develop bioinformatic tools to analyze large microbial data sets... to study the evolution of microbial ecosystems in various environments, biomolecules, and the genome by utilizing and developing computational and experimental techniques, which includes creating open-source software tools." The Meira and Shaul G. Massry Foundation established the annual Massry Prize in 1996 to recognize contributions to the biomedical sciences and the advancement of health. Fifteen Massry prize winners have gone on to win the Nobel Prize. A UC San Diego professor who splits her time between the Computer Science and Engineering (CSE) department and the School of Medicine has been selected to receive an award from the National Institute of Health (NIH) 2017 High-Risk, High-Reward Research Program. NIH created the awards for "exceptionally creative scientists" to support unconventional approaches to major challenges in biomedical research. Through the program, Melissa Gymrek, an assistant professor in CSE and SOM's Divison of Genetics, will receive the NIH Director's Early Independence Award. The High-Risk, High Reward program, part of the NIH Common Fund, accelerates scientific discovery by supporting high-risk, high-impact research proposals that may not fare well in the traditional peer review process despite their potential to advance the field. Applicants of the program are encouraged to think outside the box and to pursue exciting, trailblazing ideas in any area of research relevant to the NIH mission. "I continually point to this program as an example of the creative and revolutionary research the NIH is supporting," said NIH Director Francis Collins, M.D., PhD. "The quality of the investigators and the impact their research has on the biomedical field is astounding. I always look forward to seeing what the new awardees are proposing and to watching how it is accomplished over the years." Gymrek, who joined UC San Diego in 2016, studies genetic variation in humans. More specifically, her work focuses on mutations linked with variations in copy numbers of short tandem repeats, or microsatellites. These mutations already have been implicated in about 30 conditions. The best known may be Huntington's Disease, which causes the progressive breakdown of nerve cells in the brain. About 30,000 people suffer from the condition in the United States. These people all have more than 40 copies of a specific repeat. The more copies they have, the sooner they are affected by the disease and the more severe it is. Gymrek works on developing algorithms and other tools to better understand tandem repeats and answer questions regarding their properties and impact at a genome-wide and population-wide scale. She was selected as one of Forbes magazine's 30 Under 30 in 2017. More information is available at the Gymrek lab website. The NIH Director's Early Independence Award , established in 2011, provides an opportunity for exceptional junior scientists who have recently received their doctoral degree or completed their medical residency to skip traditional post-doctoral training and move immediately into independent research positions. Three years ago, UC San Diego computer science professor Pavel Pevzner predicted that today's massive open online courses (MOOCs) would eventually give way to adaptive Intelligent Tutoring Systems (ITS). In doing so, they could also replace traditional classroom lectures to a large extent - by dramatically changing the role of the professor. development of the adaptive online course. Benjamin Bloom, the giant of educational psychology, argued 30 years ago that the classroom is an inefficient way to teach because students learn the same material at different speeds. Pevzner agrees: "My feeling is that we are probably the last generation of professors who will use the traditional classroom as a teaching technology. Twenty years from now, packing students into a large classroom and keeping them there for an hour will probably be seen as cruel and unusual punishment." Lecturing to hundreds of students at the same time, argues Pevzner, is particularly objectionable when science, technology, engineering or math courses are involved. "Learning a complex idea is comparable to navigating a labyrinth," he noted. "In a large classroom, once the student takes a wrong turn, he or she has limited opportunities to ask a question and get back on track. This results in a learning breakdown, or the inability for the student to progress further without individualized guidance. Rather than reproducing the impersonal experience of listening to a professor's lecture in a large auditorium, online education should replicate the experience of receiving one-on-one tutoring in the professor's office." MAITs address a key limitation of both traditional classrooms and MOOCs by adaptively addressing learning breakdowns of individual students. Each student corresponds to a unique learning path through the course material. Enter the first online advanced undergraduate course designed from the ground up as an adaptive Intelligent Tutoring System (ITS). Pevzner and colleagues are about to launch the adaptive bioinformatics course on edX.org , the leading open-source, nonprofit online learning destination. The course is open for enrollment and begins on October 15, when learners around the world will be able to enroll in what edX calls the "first adaptive system for a complex course with programming assignments." "We are thrilled to partner with UC San Diego to offer this innovative course to our over 13 million edX learners worldwide," said Anant Agarwal, edX CEO and MIT professor. "The Introduction to Genomic Data Science course not only provides learners with access to content from leading experts in the field, it also showcases the latest in MOOC development technology, delivering a truly adaptive and personalized learning experience. We congratulate UC San Diego on this exciting milestone in online learning and we look forward to continuing our work together to increase access to high quality education for everyone, everywhere." The online course will lead students through individual learning paths. "It will also evaluate students at every stage of their learning to figure out how to maximize their performance and retention," said Pevzner. "The goal is to represent each learner as a pathway through the tutoring system and to analyze those digital paths across thousands of students - producing an avalanche of data that can be used to continually adjust the coursework to meet the needs of all learners." Pevzner and his former student, Phillip Compeau -- now the Asst. Dept. Head for Education in the Computational Biology Department at Carnegie Mellon University (CMU) - have created eight bioinformatics MOOCs, accounting for more than 250,000 enrollments in the past three years. Their previous online courses have been partially adaptive, and after each run of the courses, Pevzner and Compeau developed remedial modules heading off commonly occurring student issues based on new questions posed by students. As a result, the content keeps building for the benefit of future students. "The goal," observed CMU's Compeau, "is to set up a system that can be used both online and offline: in the online world, this system can mostly take our place as instructors; in the offline world, it allows us to drill down far deeper than a lecture-based class ever would dream into student understanding." As a result, Pevzner and Compeau have completely stopped lecturing in their bioinformatics classes. "We both now run a 'flipped' classroom, where students must watch short video modules and work through the Massive Adaptive Interactive Textbook (MAIT), which has integrated assessments, outside of class," Compeau explained. "So when it's time for class, we can supervise students working in groups on additional assessments and foster an environment that allows them to answer each other's individual questions." Students from CSE and other departments, including members of the Women in Computing group at UC San Diego, flocked to Florida, recently to attend the 2017 Grace Hopper Celebration of Women in Computing, which took place Oct. 3-6 in Orlando. CSE Prof. Sorin Lerner accompanied many of the students and subsequently posted a recap of the event in pictures, excerpted below. Some UCSD delegates get off plane in Orlando. Some 18,000 attendees queue for keynote. Spontaneous group photo in exhibition hall Some CSE students pose for formal portrait. CSE booth attracted potential grad studentsi. Prof. Sorin Lerner (left) with CSE students. Dinner with Ph.D. students to discuss diversity. UCSD students, staff, faculty in CSE booth. On the eve of the GHC event in Orlando, the organizer, AnitaB.org for Women and Technology, announced the results of the organization's annual Top Companies for Women Technologists program, the only industry benchmark based on statistical analysis of employer data. Although the report shows a second consecutive year-over-year increase in the number of women employed in the technical workforce, gains for women in mid-level, senior and executive roles continue to be substantially smaller than those for entry-level workers. Within the 63 participating companies, women held 22.95% of technical roles. This 1.2% increase from 2016 represents a relatively small change, but corresponds to thousands of new jobs for women technologists. Meanwhile, women continue to face significant hurdles as they advance. Representation of entry-level women increased 1.7% from 2016, while the mid-level, senior, and executive roles saw considerably smaller increases of 0.2%, 0.6%, and 1% respectively. On the positive side, 14.3% of women technologists earned promotions this year - a slightly higher fraction than their male colleagues' 13.3% advancement rate. But women technologists continue to leave their organizations at a higher rate than their male colleagues, for the second straight year. In the past 12 months, 5.7% of women voluntarily resigned, compared to 5.1% of men in comparable roles. To see Prof. Lerner's complete visual diary of GHC 2017 in pictures, visit his web page. Learn more about the 2017 Grace Hopper Celebration of Women in Computing. On Oct. 12, CSE associate research professor Nadir Weibel and some of his students gave a public talk and demonstration at the Fleet Science Center in Balboa Park. The presentation was titled, "Game Changer: Ubiquitous Computing for Health at UC San Diego," and the talk was part of series in connection with the Fleet's ongoing exhibition, "Game Masters", which opened July 1 and runs through January 15, 2018. On the third Thursday of every month, the Fleet invites local scientists, researchers and engineers to talk about how video game technology is helping them find imaginative solutions to the world's challenges. The first three speakers in the series were all from UC San Diego: CSE faculty-affiliate and structural engineering professor Falko Kuester, CSE lecturer Jurgen Schulze, and Qualcomm Institute neuroscientist Leanne Chukoskie. Weibel's students co-presenting with him at the outreach event are members of his Human-Centered and Ubiquitous Computing Lab. They included CSE Ph.D. student Danilo Gasques Rodrigues, CSE M.S. student Janet Johnson, and Bioengineering Ph.D. student Vish Ramesh. Weibel also presented some of the work of CSE Ph.D. student Steven Rick. The talks explored how gaming technologies, such as Kinect and goggles for virtual reality (VR) and augmented reality (AR), are being used to change the medical field. In their talks, Weibel and his students showcased current technologies they are researching and developing in the lab. The researchers explained how the Kinect gaming sensors can be used to monitor the human body in action, as well as for hand and gesture tracking, sign language and even to help diagnose stroke (based on changes that may affect movement in the patient's upper body. The researchers have come up with an approach they call UbiStroke, which outlines specific measurements to determine impairment from stroke, including pupil tracking, finger tracking, posture detection, speech processing, synchronicity of movements, and electroencephalography (EEG). Taken together, these measurement tools can improve diagnosis of stroke, which is critical because there is a 3-hour window to administer the main drug for the vast majority of strokes. The team also showed how "mixed reality", which combine AR, VR and regular vision, can be used to greatly increase the success rate in dealing with cardiac arrests outside of a clinical setting. "We compared participants' ability to perform CPR with the aid of a checklist in Mixed Reality, and on a tablet interface," they noted. Using a HoloLens VR system, and superimposing animated hands over the location of the user's own visible hands, the team found that civilians used the right technique for chest compressions at double the rate unprompted. They also placed the defibrillator pads at the correct location on the patient over 66% of the time, versus barely 36% of the time when the same users only had access to a tablet to guide them. They also responded much faster. The evening event attracted a multi-generational crowd to the Fleet Science Center and its Heikoff Giant Dome Theater. According to CSE Prof. Christine Alvarado, department faculty members have begun a process of "revising lower-division courses and requirements for its majors." They have developed a set of learning goals as a first step, but they are now seeking reactions and suggested changes to those goals from the broader community in CSE, including from graduate students. Explain how high level programs execute on physical systems. If you are not already part of the faculty working group (who has been getting emails from me this summer) you can also add your name to the group via the above survey. Under the theme "Build Your Dreams," student organizers hosted the 2017 SD Hacks hackathon Oct. 20-22 in RIMAC Arena. On the first evening, a CSE Alumni Reception attracted some of the department's former students who were competing or serving as mentors during SD Hacks. Appetizers, desserts and beverages were served at the reception that was open to CSE alumni only. Roughly 700 students from around the country took part in the hackathon this year. Computer engineering junior Elise Wong, lead organizer of SD Hacks 2017, told the UCSD Guardian newspaper that campus organizations played an important role in the event. "We have workshops run by other UCSD student orgs," she said. "The CSE Society held a workshop, App Developers at UCSD held a workshop, and VR Club at UCSD held a workshop. I think [it's] pretty cool that we work closely with those groups." Other hacks submitted by the end of SD Hacks 2017 included "Dining with Alexa", which gives students access to daily menu information from cafeterias, restaurants and dining halls around campus using voice commands through Amazon's Alexa platform. It was built by CSE M.S. students Tushar Koul and Janet Johnson; visiting student in CSE from Germany, Markus Duecker; and Calvin Xavier Gomez, a recent CSE alumnus (M.S. '17). 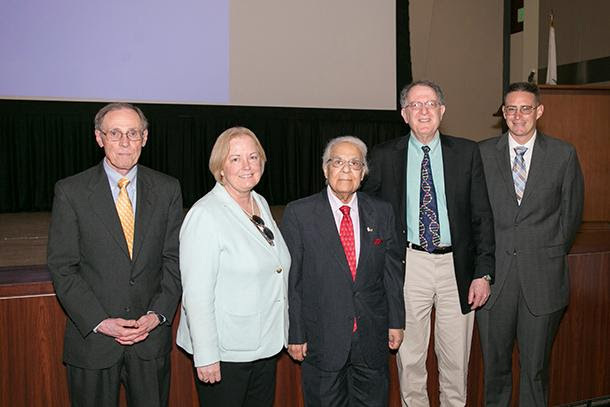 former chairs Dean Tullsen (far left) and Rajesh Gupta (far right), respectively. SD Hacks 2017 was the third annual edition of the 36-hour event. The UC San Diego Library is hosting a discussion and book signing with UC San Diego professor Rob Knight, Ph.D., who holds joint appointments in the departments of CSE and Pediatrics. 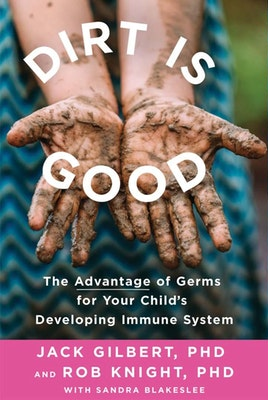 Description: In their new book, "Dirt Is Good: The Advantage of Germs for Your Child's Developing Immune System", two of the world's top microbiome scientists, UC San Diego's Rob Knight and co-author Jack Gilbert, PhD, take a fresh look at the microbiome - the combined activity of all the tiny organisms inside our bodies and the surrounding environment - commonly known as germs. At this event, Knight - director of UC San Diego's Center for Microbiome Innovation - will discuss society's recent obsession with the microbiome and its varied effects on human health, which has led to a rise in misinformation, especially for parents who are concerned about their child's health. A book signing will follow the talk; copies of the book will be available for purchase from the UC San Diego Bookstore at the event. For questions, please contact the event coordinator, Mariah Fellows, via email at mfellows@ucsd.edu. As part of the Non-Volatile Systems Laboratory Seminar Series for Fall 2017, Intel principal engineer Sanjeev Trika will explore the company's 'shattering' a longstanding problem on computing platforms, i.e., disks that are much slower than the CPU. Abstract: The I/O bottleneck has been a longstanding problem on computing platforms; disks are much slower than memory which is much slower than the CPU. While this is typically addressed by various forms of data and instruction caching and tiering, there remains a large gap between performance, cost, and densities of storage and main memory. We are tackling this problem head-on with IntelTM Optane technologies. The technologies use a new Non-Volatile Memory (NVM) which effectively fills the gap, and can be used in both Solid-State Drive and extended-memory applications. We introduce new metrics for evaluating performance of such fast NVM that can be used for both storage and memory applications, present results on example applications, and challenge the audience to innovate new system-level and application-level usages. Bio: Sanjeev Trika is a Principal Engineer, and Director of Firmware/Software R&D in the NVM Solutions Group (NSG) at Intel Corp. He leads key innovations in storage technologies, and holds 30+ patents. In the Design Lab's Design@Large lecture series, this Wednesday Cal State San Luis Obispo associate professor Brian Granger will talk about Project Jupyter, an open-source project developing software, open standards and services for interactive and reproducible computing. Abstract: The main application developed by Project Jupyter is the Jupyter Notebook, a web-application that allows users to create documents that combine live code with narrative text, mathematical equations, and visualizations. Since its creation in 2011, the Jupyter Notebook has become a widely-used, open standard for developing, sharing, communicating, and reproducing computational work in scientific computing and data science. After introducing Project Jupyter and the ecosystem of projects around it, I will broaden the discussion to address the general design considerations for interactive computing and how those relate to 1) the underlying Jupyter software architecture and 2) ongoing work to design and build new user interfaces, such as JupyterLab, that better serve our users. 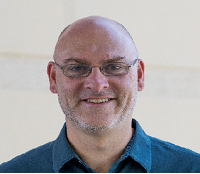 Bio: Brian Granger is an associate professor of physics and data science at Cal Poly State University in San Luis Obispo, CA. His research focuses on building open-source tools for interactive computing, data science, and data visualization. Brian is a leader of the IPython project, co-founder of Project Jupyter, co-founder of the Altair project for statistical visualization, and an active contributor to a number of other open-source projects focused on data science in Python. He is an advisory board member of NumFOCUS and a faculty fellow of the Cal Poly Center for Innovation and Entrepreneurship. Coming up in CSE's Distinguished Lecture Series is Rice University professor of computer science Lydia Kavraki, who will discuss robots, biomolecules and physical computing. Abstract: Over the last decade, the development of fast and reliable motion planning algorithms has deeply influenced many domains in robotics, such as industrial automation and autonomous exploration. Motion planning has also contributed to great advances in an array of unlikely fields, including graphics animation and computational structural biology. This talk will briefly present the state-of-the-art in sampling-based motion planning and will then focus on approaches that can be applied to general robotics systems in order to produce motion plans that satisfy high-level specifications. High-level specifications declare what the robot must do, rather than how this task is to be done. This line of research explores the links among formal methods from logic and verification, classical motion planning from robotics, and task planning from artificial intelligence. Although research initially began in the realm of robotics, the experience gained has led to algorithmic advances for analyzing the shape and function of proteins, the worker molecules of all cells. The talk will conclude by discussing robotics-inspired methods for computing the flexibility of proteins and large macromolecular complexes with the ultimate goals of deciphering molecular function and aiding the discovery of new therapeutics. Bio: Lydia E. Kavraki is the Noah Harding Professor of Computer Science, professor of Bioengineering, and professor of Computer and Electrical Engineering at Rice University. She received her B.A. in Computer Science from the University of Crete in Greece and her Ph.D. from Stanford University. Her research focuses on physical algorithms and applications in robotics, computational structural biology, and translational bioinformatics. Kavraki has authored more than 200 peer-reviewed journal and conference publications and is one of the authors of the widely-used robotics textbook titled "Principles of Robot Motion" published by MIT Press. Her group develops and distributes the Open Motion Planning Library (OMPL). 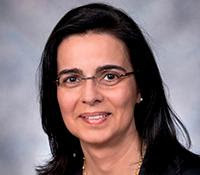 Kavraki is the recipient of the 2000 Association for Computing Machinery (ACM) Grace Murray Hopper Award, a Fellow of ACM, IEEE, AAAS, AAAI, AIMBE, and a member of the National Academy of Medicine. She received the ACM Athena award in 2017.